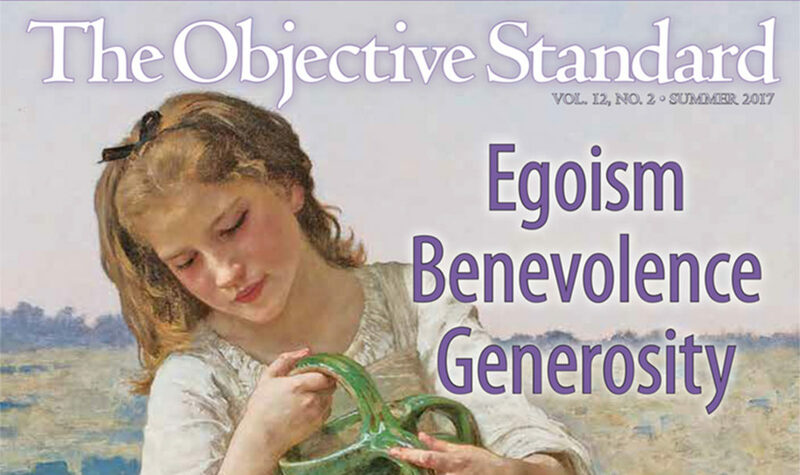 Welcome to the Summer 2017 issue of The Objective Standard—also known as the journal for people of reason. This issue continues our pivot away from heavy focus on politics and toward greater focus on deeper philosophy and the arts. I hope you’re enjoying this change of direction as much as we are and finding the articles both clarifying and entertaining. Let us know what you think! 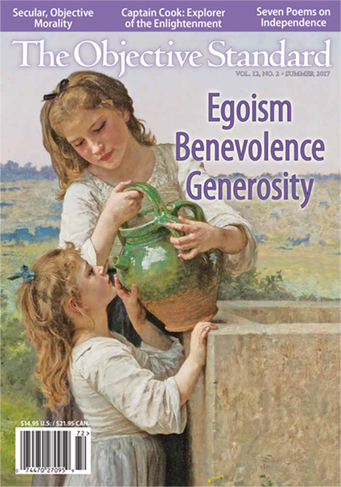 First up is my article “Egoism, Benevolence, and Generosity,” which shows that the latter two elements, although not moral virtues per se, can be and often are profoundly selfish, given certain objective provisos. In “Religion Is Super Subjectivism,” I examine a related point—namely, that, contrary to the claims of many religionists, a morality that somehow comes from the will of “God” is not only subjective but, indeed, is the most subjective morality of all. In “The Vital Function of the Left-Right Political Spectrum,” I argue that this spectrum has a life-serving purpose—but only if we conceive it in terms of the basic political alternatives, freedom versus force—and not if we treat the opposite ends of the spectrum as competing versions of statism. Next, in “Enslaved by Altruism,” Dr. Binswanger considers the widespread media outrage concerning the so-called Ryan plan and shows that the fury is a function of the extent to which Americans regard people’s needs as constituting rights. Wrapping up the feature articles, “Seven Great Poems on Independence” gathers soul-fueling gems by William Ernest Henley, Henry Lawson, Edgar Guest, Badger Clark, Ralph Chaplin, Dale Wimbrow, and Robert Burns. You’ll want to read and share this collection early and often. Enjoy the Summer issue—and make your summer the best it can be!